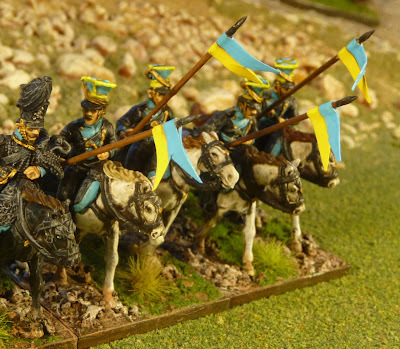 My second submission to the painting challenge is some Brunswick Cavalry. 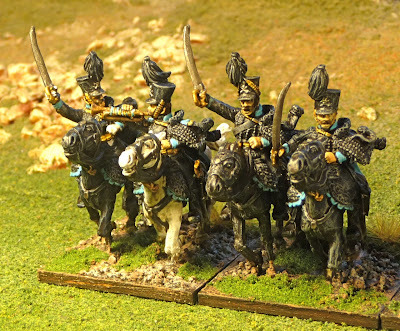 I have painted the Brunswick cavalry as at Waterloo, but I can also use the Hussars in the peninsula. I believe there were two squadrons of Hussars brigaded with the British 20th Light Dragoons. At Waterloo, they were brigaded with the Cavalry Corps under the Earl of Uxbridge. Major von Cramm was the officer in command. They were a large unit with more then 900 men and horses. This unit represents 3 squadrons of Hussars and a squadron of Uhlans. I represent each squadron with 4 figures. There were actually 4 squadrons of Hussars, so I will need to add 4 more figures sometime in the future (I have 2 extra Uhlans, so if someone wants to make a trade with some money, I would be quite happy to do so). I am not sure if they saw action or not, but certainly they are going to look good on the gaming table. These were primed white, airbrushed with black ink and then heavily dry brushed with Vallejo Dark Prussian Blue. A final light dry brush Vallejo London Grey was used to bring out pelises, fur and straps. I believe I will go with this method for the rest of my Brunswickers. This is the largest cavalry unit I have painted with 16 figures, previously my max was 12. These are Perry figures and were quite nice to paint. I do like the horses, but they were a little fragile, I believe I snapped off at least an half dozen legs. Just to show that I do follow suggestions, here are my cannon with the openings in the barrels painted black, with some black wash.
Really impressive unit John. Happy new year! A fearsome looking cavalry unit! Great looking unit John! Well done. Excellent work John. I like how you did the black horsies. Very nice - the Brunswick troops had the best uniforms! I think we all feel the need to mount the Brunswick Hussars on black horses; even my venerable Minifig version form 25+ years ago has black horses, but brown for the Uhlans. Very very nice John. An unusual way to paint them too, a white undercoat then inked black, very effective though!!! Wonderful looking cavalry! Really like your painting of all that black! One can only love these colour combinations and your execution! Well done!